A month ago, The New York Review of Books blog had a post by Harold Bloom with the title My Favorite Book in the Bible. This got my attention, and I read the short piece on what turns out to be Jonah. 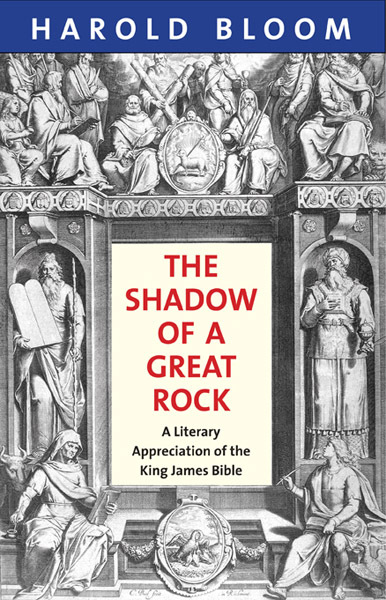 A note at the end explained that the piece was from his upcoming book The Shadow of a Great Rock: A Literary Appreciation of the King James Bible, to be published in September. A week and a half ago, I was mentioning the upcoming book to someone and then thought to myself that I should order it. I checked at Amazon and it was already available. It arrived last Tuesday. Perhaps I should point out that this year is the 400th anniversary of the KJB, a natural occasion for a review of its literary merits. After dinner Tuesday, I sat outside and jumped around in the book to get a taste of what Bloom had to say about Genesis, or the David stories in 1 and 2 Samuel, or Job and Ecclesiasted, or Mark, or Paul’s writings. It quickly emerged that this was by no means a systematic study. Rather, Bloom seems to be running some of the greatest hits through his mind, then sharing them with the reader in a casual chat. Often he will contrast the rendering of a passage in the KJB and with the translations of its two great predecessors, Tyndale and the Geneva Bible. As one example of Bloom’s readings, I’ll turn to his discussion of Exodus 15:1-18, the Song of the Sea. Sometimes he will compare the translation with the Hebrew itself, but in this case he admits that the passage “is composed in so difficult and archaic a Hebrew as to daunt me. I am not equal to judging the aesthetic contrast between the original and the KJB version, particularly since Handel’s setting of it (Israel in Egypt) will not leave my inner ear.” In lieu of the original Hebrew, he turns to William Propp’s literal rendering of the passage in Exodus 1-18 (The Anchor Yale Bible Commentaries). My tiny excerpt from Exodus hardly does justice to Bloom’s approach, as I haven’t allowed you the pleasure of reading the full passages from Tyndale and the KJB. While doing so, one inevitably forms one owns thoughts,before Bloom chimes in, about how they differ, and when he does chime in, he’s a most welcome companion. After my initial foray, in which I jumped around at will, I put the book aside for a few days, returning over the weekend to begin reading it in the order in which it is presented. I got through Bloom’s discussion of Genesis, Exodus, Numbers, and Deuteronomy, a little more than a fourth of the book. I look forward to the rest, though I may put the book aside again for a bit. I don’t anticipate taking it on our forthcoming trip. No room for physical books; just e-books.